A week ago I posted Don't skunk me, bro!, which riffed on Jonathon Owen's post Skunked Terms and Scorched Earth on Arrant Pedantry. Jonathon's post had discussed Bryan Garner's practice of declaring that certain expressions should be avoided because they are supposedly "skunked". Garner uses that term to refer to expressions that are in the process of undergoing a hotly disputed change of meaning, with the result that, in Garner's words, "any use of it is likely to distract some readers". Shortly after posting "Don't skunk me, bro! ", I got a message on Twitter from Tcherina (@grammarguidecom): "Glad to see you taking up the 'skunked' issue. I got bullied and splained when I tweeted Jonathon's piece [i.e., the post that had prompted mine], which I thought was very good." a screenshot of a tweet by Lynne Murphy, a linguistics professor, quote-tweeting* an earlier tweet by Benjamin Dreyer, who is (although I didn’t know it at the time) a vice president, Executive Managing Editor, and Copy Chief at Random House. The post was titled, "There's a fine line between recursion and intertextuality." A screenshot of the post is provided below the fold—but I hasten to add that I am providing the screenshot solely as a convenience to the reader, to save them the trouble of having to leave this post in order to look at that one, should they be so inclined. "Laws on foreign influence just the beginning in fight against Chinese coercion", Peter Mattis, Sydney Morning Herald (12/7/17). "Malcolm Turnbull declares he will 'stand up' for Australia in response to China's criticism", Caitlyn Gribbin, ABC (12/9/17). Please, talk to each other. It's important to linguists that there should be plenty of chat. We need language live, on the hoof. Millions of spoken word tokens everywhere, so that we can (for example) compare Donald Trump's amazingly high proportion of first-person singular pronouns to the average for non-narcissists like typical Language Log readers. However, beware of engaging in chat to strangers on the subway if you are in London. 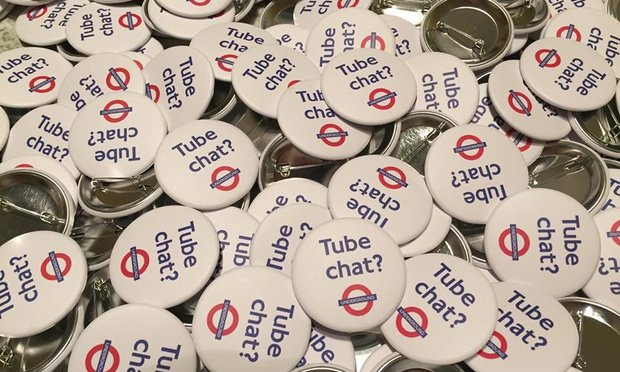 A new campaign for people to wear a "Tube chat?" button when traveling on London Underground trains, intended to provoke random conversation with other passengers, has been met with horror and disdain by the misanthropic curmudgeons who use the services in question. No chat please; we're Londoners. In the office where I work, there is a Chinese grad student having a phone conversation. I have no idea what he's saying. But what's striking is that, every so often, he drops a phrase that sounds uncannily like the N-word. No, I don't think he's bitching about American ethnic groups to his friends. It's probably shop talk in his research field. It's just the way my ears process what are probably the Szechuan or Mandarin equivalent of "I think…" or "Maybe…"
But two things are kind of striking. The first is how much my ears ping when the phrase happens. (I don't think they'd ping the same way if he dropped soundalikes for other Certain Words.) The second is that I start wondering how many fights or attacks may have happened because someone else overheard an equally mundane conversation, and thought that the word was being tossed around casually. For those wondering why on earth an official announcement about the solemn business of executing a traitor would use wildly overheated language like "despicable human scum" and "worse than a dog" (especially about the uncle of the reigning monarch), the BBC has published a short article on the language of North Korean posthumous character assassination. Advertising seeks to persuade, and everyone knows it. The typical ad tries to induce a customer to do one thing—usually, buy a product —instead of a thousand other things. There is nothing obscure about this purpose or what it means for buyers. Consumers obtain immense amounts of information from a process in which the providers of information are blatantly self-interested and the recipients fundamentally skeptical. The Federal Trade Commission, which is in the business of regulating advertising, happens to agree with Calfee about the protective effects of identifying persuasion for what it is. Which is one reason why it's recently clarified its guidelines on endorsements to require that bloggers and social media users disclose any pecuniary relationship with the makers of the products they're shilling for—even if free stuff is all they're getting for their efforts. At the very hour when, a few days ago, Victor Mair was posting his piece about Valentine's Day in Japan (I Tiger You), I was at ground zero for the event: the candy section of the biggest department store in Tokyo's Ginza district. I have never seen anything like it. Excited young women by the thousand buying up all the chocolate and other candy that industry could pack into pink and white heart-bedecked boxes and bags. What an incredible coup the candy manufacturers have made out of this celebration of girlfriendhood and boyfriendhood. The ratio of refined sugar and teenage girls to oxygen had reached danger level in the confined space of the department store basement, and I fled from this stampede of candy lust, escaping into the cold afternoon air. I'll tell you a secret: I simply cannot bear Tokyo. on behalf of the British government, and all those who live freely thanks to Alan's work I am very proud to say: we're sorry, you deserved so much better. That's how to say it (ignoring the punctuation error — the missing comma after work): not a bunch of evasive mumbling about how unfortunate it all was, but a simple "We're sorry." In the Best Western El Rancho Inn on El Camino Real in Millbrae (Millbrae sounds Scottish but it is near the San Francisco International Airport; I am waiting for a flight to take me back to Edinburgh) the Colombian-made cotton towels and facecloths bear a label stating the brand name "Five Star". El Rancho is nice, but it is a standard-grade California motel, not five star. Could the towel company be trying to misinform me about the quality I am enjoying? In the Office Depot store across the street from the El Rancho there is a demo of wireless printing from an HP laptop to an HP All-In-One printer / scanner / fax / copier / toaster. The sign brags about the built-in wireless networking and says you should open WordPad on the laptop and type something and then click "File | Print", and what you typed will magically appear on the nearby printer. But I checked the laptop more closely. Discreetly plugged into the side of it is a USB cable. I traced the cable. It runs to the printer. There is no wireless connection at all. Could they be trying to mislead me about how well wireless printer networking works?